The Alias TV show was a 60 minute spy action series on ABC about a young woman who was recruited to work for a top secret branch of the CIA called SD-6 during her freshman year of college. When she learned that SD-6 was actually a rogue international organization called "The Alliance of Twelve" with the goal of ruling the world, she became a double agent so she could help the real CIA destroy the Alliance. The "SD" in "SD-6" stands for Section Disparue which, in French, translates to "the section that disappeared". All interior scenes on Alias are filmed at the Walt Disney Studios lot in Burbank, California. Many of Alias' outdoor scenes, even those taking place outside the U.S., are also shot there. The creator of Alias, "J.J. Abrams" claims that he got the idea for the series from an idea he once had for his series, "Felicity". Felicity would have become a federal agent during one of her summer vacations. By the way, some scenes in the first episode of Alias were filmed on the set of "Felicity". The scenes in Danny's apartment and in the bathroom when Sydney died her hair red, for two examples. J.J. Abrams was not at all happy with the fourth season's two-part premiere so he reshot everything in only five days! Jennifer Garner had to audition six times before being cast in the role of Sydney Bristow! Eric Weiss is also the birth name of the legendary magician, Harry Houdini. Will Tippin even commented on that fact in the final episode of the second season! Jennifer Garner had a starring role on a series titled, "Time of Your Life" right before getting her role on Alias. That series unfortunately only lasted 12 episodes. "My name is Sydney Bristow. Seven years ago I was recruited by a secret branch of the CIA called SD-6. I was sworn to secrecy but I couldn't keep if from my fiance. And when the head of SD-6 found out...he had him killed. That's when I learned the truth. Sd-6 is not part of the CIA. I'd been working for the very people I thought I was fighting against. So I went to the only place that could help me take them down. Now, I'm a double agent for the CIA where my handler is a man named Michael Vaughn. Only one other person knows the truth about what I do. Another double agent inside SD-6. Some one I hardly know ... my father." 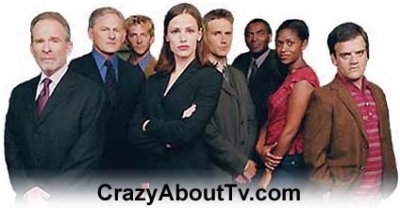 Thank you for visiting our Alias TV Show Cast and Episodes page!